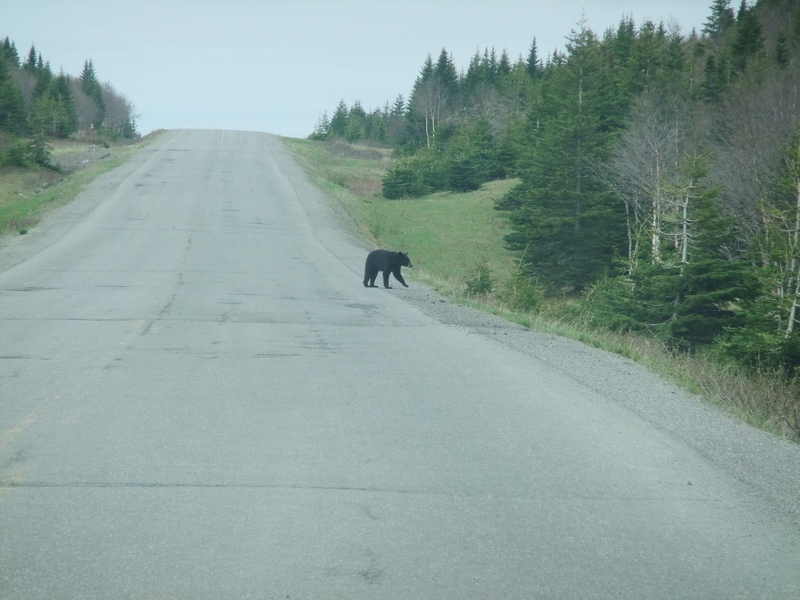 Jenn of Wildwoods Farm was driving ‘cross country road’ – the road between Roddickton where one crosses the top of the peninsula to get to the Straits side via Grenfell Drive, Route 432, when she saw a Mama Black Bear crossing the road. Her photo was taken about 9 in the morning during the first week of June. It is incredible the amount of wildlife one has the opportunity to see when driving our highways in Rural Newfoundland & Labrador. I had travelled over this past weekend to St. Anthony, L’Anse Aux Meadows, Quirpon, Main Brook, Conche, Roddickton–Bide Arm and Englee and saw quite a few moose and other smaller critters. However, I have yet to see a bear this year. One trip to Conche last summer with a friend from Montreal, we did get a view of a young cub at roadside. It was my first black bear sighting in nearly 25 years on the rock. A few days later I would spot another black bear on the Trans-Canada Highway en route to Paradise to visit my sister. I re-call when Winnie the Pooh was trapped in Rabbit’s burrow and Rabbit placed a sign, “Don’t Feed the Bear!” Remember, that is good practise as they are wild animals. Thank you Jenn for providing Live Rural NL readers the opportunity to see your supplied photo. I encourage you and others to send images of Great Northern Peninsula and I will do my best to make them available. Email liveruralnl@gmail.com. Posted on June 21, 2011, in Landscapes/Geography and tagged bear, Bide-Arm, canada, englee, Great Northern Peninsula, Main Brook, Newfoundland & Labrador, Roddickton, Trans-Canada Highway. Bookmark the permalink. 4 Comments.